Gila Trout Oncorhynchus gilae, and Apache Trout Oncorhynchus apache are critically threatened species that can be found in various streams of the Southwest. The general public is often unaware that these species exist due to many factors including a dissociation of fish and desert environments and limited availability of high quality underwater and surface footage of Arizona streams. Surface and underwater videography was utilized to create an educational video on Gila and Apache trout from Mount Graham streams to be displayed at a Coronado National Forest visitor center and other locations. We captured high definition quality footage with low cost equipment with the intention of enabling natural resource managers to produce similar conservation videos easily in the future. To evaluate what aspects make a conservation video most effective, the footage was shown in a public space. By analyzing which images people viewed the most, we were able to understand how we might produce more engaging presentations. Macro images, contrasting colors, texture, and movement held audience attention the longest. These results allowed us to draw conclusions about which factors and characteristics of the film contributed to optimal audience engagement. Well-designed videos will better acquaint people with species that are not commonly seen, thus aiding in their conservation. Videos were produced for display for the U.S. Forest Service, Coronado District. Hannifan, J. K., M. L. Caballero-Reynolds, T. L. Ulrich, and S. A. Bonar. 2016. 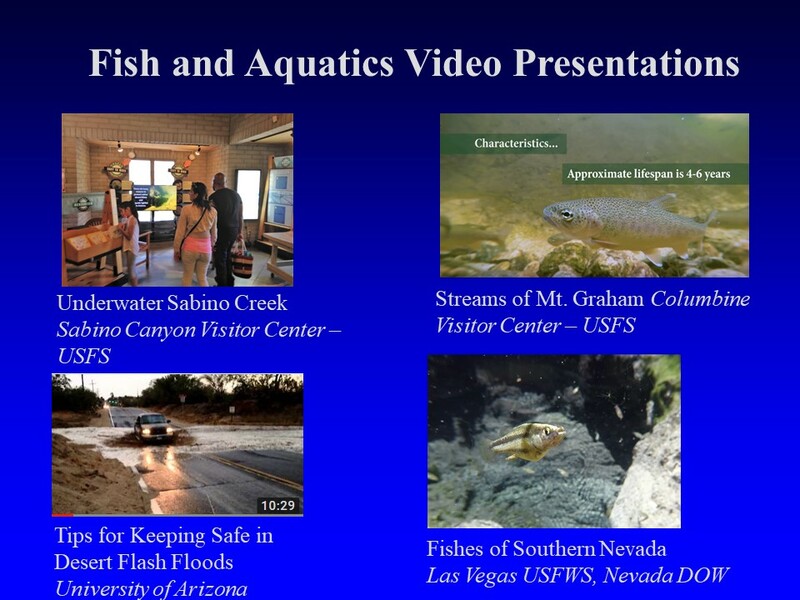 Videography presentations to educate the public about Arizona trouts. 48th Annual Meeting of the Desert Fishes Council, November 15-19, 2016. Albuquerque, New Mexico. (Contributed, Oral).